Saturndust deliver a stressed atmospheric sound in their latest offering to the doom metal world. Mixing strong riffs with agonizing solos and synths emitting space samples, they've created a sound that will take you to the deadest areas of the universe and crush you under its weight while keeping everything in a state of total atmosphere. After a brief sample to set the mood, the first track starts off with a simple yet beefy riff that transforms into an opus of soaring, aching vocals coupled with atmospheric space noises that is sure to give you the feeling of being lost in deep space that the band is certainly trying to achieve. The rest of the tracks are all solid too and range from slow and melancholy to riff and solo laden pieces. The album feels whole and flows well for a doom album. Everything seems to be where it should be and is written exceptionally well. I actually felt like I was in a dead area of the darkest depths of the universe while listening to this album. Some of the songs appear to borrow influences from classic 1970's and 80's metal and hard rock bands such as Black Sabbath and Led Zeppelin along with Bathory and Candlemass all while creating their own unique blend of atmospheric doom metal. The album is almost relaxing at times when it's not putting pressure on your mind and ears due to it's heavy and deep tone. All in all, Saturndust has released a very good record that manages to spark my imagination and transport me into places I wouldn't ever want to visit in my right mind. 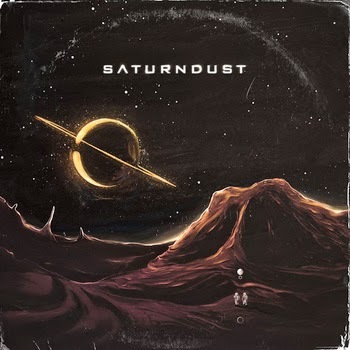 If you're prepared to feel a pained and agony ridden soundtrack to deep space, Saturndust has put forth a terrific offering for you to feast on.